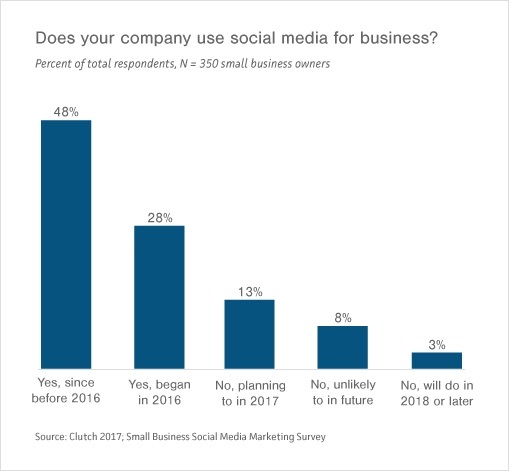 A new survey by Clutch, a B2B ratings and reviews firm in Washington, DC, finds that nearly 25% of small businesses do not yet have a social media presence. Furthermore, 8% say they are unlikely to ever use social media for their business. The survey’s respondents include 350 small business owners or managers. Using the findings from the survey, along with analysis from social media marketing experts, Clutch offers five tips for these small businesses just beginning their social media marketing journey. 1. Get on social media. Twenty-four percent (24%) of small businesses are not yet on social media. If this includes your small business, you should reorganize your marketing strategies, especially if your customers are in any way on social media. If you’re hesitant about the benefits of social media, consider the cost. “I’m finding cost in social to be a fraction of what we’d normally see in the traditional marketing space,” said Joshua Dirks, co-founder and CEO of Project Bionic, a Seattle-based creative marketing agency. LYFE Marketing found that the cost per thousand impressions (CPM) on social media is significantly lower than many other traditional channels. The survey indicates that over 90% of small businesses with a social media presence are on Facebook. Twitter, the second place finisher, is used by 55% of respondents. The huge gap in usage between Facebook and all other channels showcases the dominance of Mark Zuckerburg’s juggernaut. Not only is Facebook’s user base massive, with almost 2 billion users, but its advertising platform has the power to highly target customers and generate detailed feedback on the effectiveness of your efforts. If you only have the resources for one channel, try Facebook. While the survey found that the majority of small businesses using social media share content or engage followers at least once per day, the best frequency is dependent on your goals. For example, Alex Oesterle, owner of the Denver-based social media agency Blue Bear Creative, recommends starting out with 1-2 posts per day on Facebook and several per day on Twitter. Using the results from those posts, you can adjust the timing and quantity in order to receive optimal results. Likewise, you should experiment with different metrics. The best ones to track largely depends on your company’s social media goals. For example, if you’re having trouble growing your channel’s audience, try working toward engagement. Encourage your audience to interact and make the most out of the followers you do have. Having a small number of engaged followers is better than having thousands of followers that do not read your content. Over half of small businesses use in-house staff for social media marketing. This is fine, as long as those employees are knowledgeable. Trusting your social media to interns or the youngest team member in your office just because you think they can do it best is a mistake, according to Dirks and Oesterle. If your social media isn’t run properly, you won’t see significant results, and it will only further discourage your business from investing the time and budget that these channels require. Social media is a vital endeavor for most modern businesses, large or small, if they want to achieve well-rounded marketing success. According to Clutch’s survey, the majority of small businesses already reap the benefits of a social media presence. However, for the quarter who are hesitant or have not yet begun, these tips provide clear advice to keep in mind when taking those first few steps. Riley Panko is a Content Developer and Marketer at Clutch, a Washington, D.C.-based research, ratings, and reviews platform for B2B services. She conducts relevant research that aims to help consumers enhance their business and select the services and software best suited to their needs.